Keshia Barnes is as an associate attorney in the Dallas office of DeHay & Elliston, L.L.P. Ms. Barnes concentrates her practice on Mass Tort Litigation and Products Liability Defense. 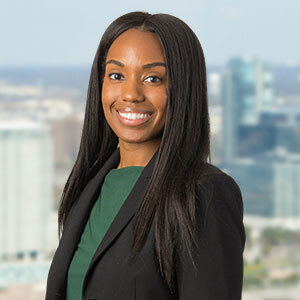 Prior to joining DeHay & Elliston, Ms. Barnes worked at a Texas-based firm, where her practice focused primarily on personal injury litigation. Ms. Barnes received her Bachelor of Arts degree in Political Science from Southern Methodist University in 2010. She then attended Southern Methodist University Dedman School of Law, where she received her Juris Doctorate in 2014. While in law school, Ms. Barnes served as a student attorney in the civil clinic.